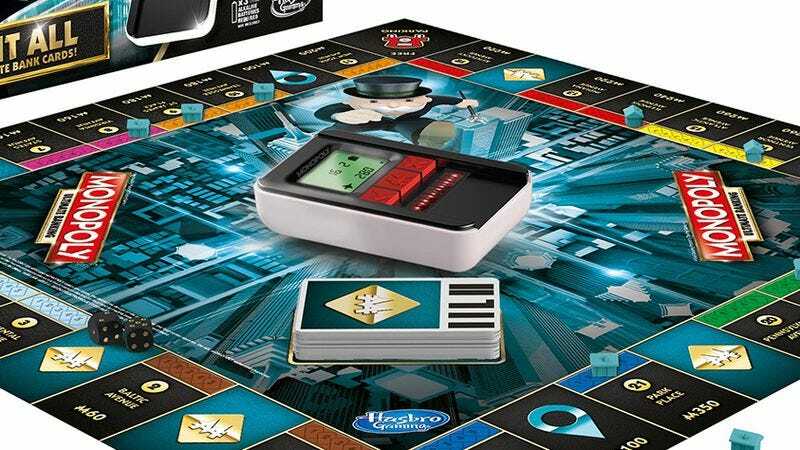 With its newest Monopoly release, Hasbro seems to be willing to do something that our elected officials are not: Regulate the banking system and make it harder for unscrupulous individuals to cheat. For its upcoming Monopoly Ultimate Banking, a modernized version of the classic real estate and free market-themed board game, the toy company has eliminated Monopoly’s colorful wads of cash. Instead, players will scan personal credit cards with a small battery-operated ATM, which will automatically keep track of their cash on hand. The tiny electronic bookkeeper will also be used to purchase properties, pay debts for landing on opponents’ properties, and exchange money for Chance drawings through the use of scannable bar codes on each of the cards. To use it, players swipe their credit cards, followed by the corresponding property or play card, and the machine deducts or pays off money in accordance with the rules. No more shady back-room accords. No more of the highly contentious Free Parking house rules that have driven wedges through friendships and familial relations. No more palming a 50 when your little sister’s back is turned. Just meticulously accounted, officially sanctioned maneuvers. So much fun! In an apparent effort to throw a little more chaos into the game, game designers are also adding a new kind of Chance cards called “Life Events.” These can cause financial game-changers like fluctuating rents, which the ATM will be able to easily track. But will it be able to account for the inevitable flipping of the board when one player lands on another player’s Boardwalk hotel for the third time?